Dachshunds, like many other small breeds, are prone to dry skin. Symptoms of dry skin include scratching, licking, biting and rubbing against floors or furniture. These symptoms can lead to more serious conditions, such as bleeding, infection and hair loss. Many Dachshund owners are at a loss for what to do about their dog's dry skin. It's really just a matter of careful treatment and prevention. Prepare a bathing area for your Dachshund by filling a bath tub with lukewarm water. It should only be deep enough to reach the dogs knees. Mix in one full cup of olive oil with the bath water. The olive oil will help sooth the itch on your Dachshund's skin. Place your Dachshund in the bath and using a plastic cup, wet your dogs entire coat thoroughly. Let your dog stay in the bath for 10 to 15 minutes while the oil goes to work conditioning your Dachshund's skin and coat. Let all the oily water out of the bath tub and using the shower head sprayer, rinse the oil off your dog as best you can. There will be some oil residue left. Take the oatmeal puppy shampoo and lather your Dachshund's fur with it. Massage it into the coat and let it sit for a minute. Rinse your dog and repeat the lather. After rinsing the second lather, apply oatmeal creme rinse to your Dachshund's coat. Massage this in and let it stand for five full minutes. Rinse the creme rinse off and towel dry your Dachshund. Do not blow dry your dog; this will only irritate the dryness. Brush your dogs coat gently with a soft brush. Using a soft brush is important to prevent further irritation. 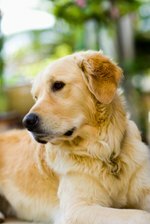 Allow your dog to dry fully and then brush the coat again. This will help prevent mats from occurring and further irritating dryness. Continue this bathing and brushing process once a week to prevent future dry skin. Cut the tip of one side of a vitamin E liquid capsule so it opens the capsule. Pour the contents into your Dachshund's food once a day. This will help prevent PH imbalance in your Dachshund's body, which can lead to dry skin.